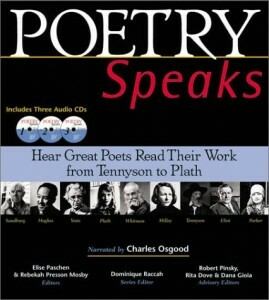 Poetry Speaks features the work of the most influential writers in modern poetry — written and performed —from 1892 to 1997. 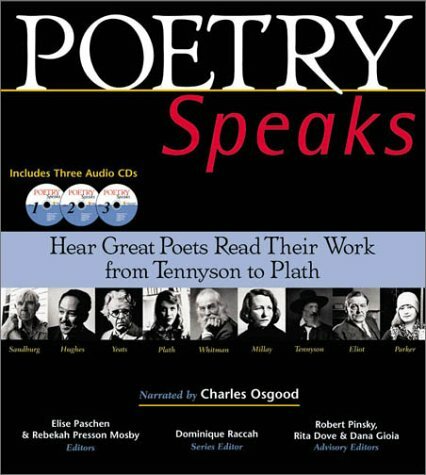 This book combines their most significant poems in print with the authors themselves reading their poetry on audio CD. Poets range from Alfred, Lord Tennyson, Walt Whitman, T.S. Eliot and Dorothy Parker to Langston Hughes, Allen Ginsberg, Sylvia Plath and Gwendolyn Brooks. The power of spoken poetry is at the heart of Poetry Speaks. Poetry is a vocal art, an art meant to be read aloud. Listening to a poem read aloud can be a transforming experience. Poetry Speaks not only introduces the finest work from some of the greatest poets who ever lived, it reintroduces the oral tradition of poetry. It is a remarkable feat of assemblage, with excellent capsule biographies and explanatory notes at the end of each volume — the biographies, especially, are well worth reading. Dorothy Parker, Wallace Stevens, Robert Frost, Marianne Moore, William Carlos Williams, Claude McKay, and T.S. Eliot all seemed to appear out of thin air, imparting their accents to the modernist uproar. But for sheer splendor and big-tent inclusiveness, American Poetry: The Twentieth Century, Volume One: Henry Adams to Dorothy Parker looks to be an essential starting point. Weighing in at nearly 1,000 pages, there are hundreds of poems here, representing more than 80 authors, and thumbing through the selections should be enough to send most readers into linguistic rapture. Lesser figures, from Sara Teasdale to H.P. Lovecraft, get their days in the sun. Offering the best selection of poems about NYC, this collection is perfect in our world after the tragic events of 9/11. Indeed, the volume is so current that it includes work that was written on the date by David Lehman (“The World Trade Center”). Others in the collection are Walt Whitman, Allen Ginsburg, Marianne Moore, Wallace Stevens, Hart Crane, W.H. Auden and more than 40 others. Mrs. Parker is included with “Observation” in the book. It is an instant classic and worth owning. Also a good gift book. Kudos to editor Elizabeth Schmidt for the selections. Remnick, New Yorker editor since 1999, and Finder, the magazine’s editorial director, recommend taking this book in small doses. It is simply the best collection of the best short pieces by the best humor writers of our times– Dorothy Parker, Robert Benchley, James Thurber, E. B. White, S. J. Perelman, Groucho Marks, Steve Martin, Veronica Geng, Woody Allen, Ogden Nash, Martin Amis, John Updike, Mike Nichols, Garrison Keillor, Clarence Day, Frank Sullivan (The Cliche Expert)– what more could one want? Plus, the discovery of some very funny writers who may be unknown to you. Selected from The New Yorker’s plentiful larder, Secret Ingredients celebrates all forms of gustatory delight. Dorothy Parker is included, along with Calvin Trillin, Bill Buford, Adam Gopnik, Jane Kramer, Anthony Bourdain, and many more. Plus, cartoons! Celebrating the 75th anniversary of The New Yorker, a collection of the best stories about New York by New Yorkers. Dorothy Parker’s classic shot at civil rights and high society, “Arrangement in Black and White” is a standout. She helped invent “The New Yorker Short Story” in 1925. In Wonderful Town: New York Stories from the New Yorker are treasures from John Cheever (“The Five-Forty-Eight”), James Thurber (“The Catbird Seat”), Maeve Brennan (“I See You, Bianca”), Isaac Bashevis Singer (“The Cafeteria”), Jamaica Kincaid (“Poor Visitor”), and many others. There are 43 pieces in all. A wonderful book to own or give to someone who loves short stories. For 75 years, these gems under 1,000 words (“talk stories,” as they are referred to by staff) have appeared in The New Yorker’s “Talk of the Town” column. Ross, a contributor for 45 years, has collected the best of these essays. Among the writers are E.B. White, Robert Benchley, Harold Ross, James Thurber, Andy Logan and more. Lillian Ross herself spoke with a 25-year-old Norman Mailer (1948). More recent talk stories on Susan Orlean, John McPhee, and Julian Barnes are included.